The equity correction of last week was reversed on Monday, with SPX putting on 1.4% (DJIA 1.7%). Friday and Monday were the biggest two-day rise for SPX since January 2016. DAX, FTSE and NKY also rose, the first after a pullback. 10-year US Treasury yields briefly touched a new four-year high of 2.902% but then fell back to post only 2bp up on the day. Currency markets continued to ignore the equity and bond volatility with DXY down 0.3% on the day. Main components EUR and JPY were up, along with AUD, but GBP and CAD were slightly down. Gold was up in line with the DXY fade, and Oil posted its sixth successive red candle. Our friends at marketseasonals.com tell us that DAX usually rises on a Tuesday. Well not this week it didn’t. After gapping down, the German index faded all day, despite a brief rally when NY desks first opened. After returning from Monday’s holiday, NKY similarly posted a massive 770 point drop during the Asian session, although 61.8% of this had been recovered by the US closing bell. FTSE was also down after GBP was boosted by the UK CPI/RPI/PPI beats at 0930, It was a turnaround Tuesday in Europe and Japan (not China, which rose), but the resilient SPX took no notice of this and gently rose all day to finish 0.3% up (DJIA 0.2%, NDX 0.5%). A complete US/others disconnect today. In forex, the yen continued its rally, adding 0.76%, and EUR and GBP were also up, producing a 0.4% drop in DXY. Yields were down in line, although this link is far from strong at the moment. AUD was flat and only CAD gave a little ground against USD, following a further decline in Oil. Gold continued to rally, up $6 in line with the equity turmoil. Valentine’s Day saw traders loving equities which rallied hugely on Wednesday. The pre-market CPI beat and Retail Sales miss at 1330 initially cause a huge spike down (500 points exactly on DJIA), but this was then followed by a much larger rally in equities. From the pre-market low to the close, SPX put on 71 handles (2.72%). The huge rally was shared elsewhere with all indices dipping and then advancing sharply, with the VIX ending the day below 20. Everything was up today except the dollar, whose decline was as spectacular as the equity ramp. DXY gave up 0.76%, with all currencies advancing, and Gold had its best day since Brexit, up 1.58%. However, the initial equity spike down was accompanied by a short-lived rally in USD, and it was interesting to see which currencies moved. 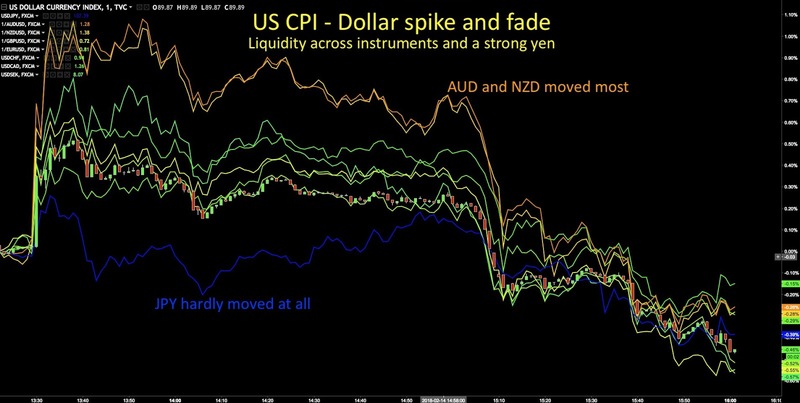 The strongest movers (down) on the spike were AUD and NZD, risk-on sells, but normally quiet in the US session. The others tended to move together, but tellingly, JPY hardly moved at all and commenced its decline much sooner. Oil was up 3%, and yields disconnected themselves from the dollar again and made a new high, 7bp up at 2.91%. 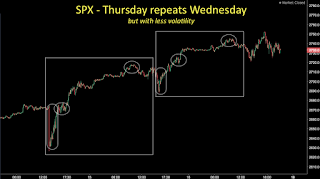 Thursday produced SPX price/action we see very rarely, an ‘echo’ of the previous day, where similar price action occurs but with less volatility. There was no particular trigger, like the CPI figure, as the spike down part lasted an hour from 1500, and can hardly have been caused by the NAHB Housing Market Index print coming in as expected at that time. The pattern was seen, to a degree across the other equity markets, and all finished up, although the increase in FTSE was only marginal due to the strong pound. On Wednesday, the dollar moved (inversely and )concurrently with equities. Today, the dollar spike was far more muted, and was only really noticeable in AUD and CAD. (Incidentally, the big miss on the Australian jobs report only produced a 28 pip drop, quickly recovered, much less than this spike which faded AUD 44 pips) Nevertheless, by the close, USD was well down (DXY shed 0.8%) against all currencies by the end of the day, hitting a Trump-era low against JPY. Of course other currencies have long passed that point, DXY is 9.61% lower than election day. Gold was only slightly up after the previous days ramp, but still made a three-week high. Bond Yields and Oil dipped sharply and recovered with equities, but both only managed to close flat. Friday was Opex day, and equities continued to recover following the US Michigan Sentiment beat at 1500. US indices reached the 61.8% fibonacci retracement point from the Jan 29 high. 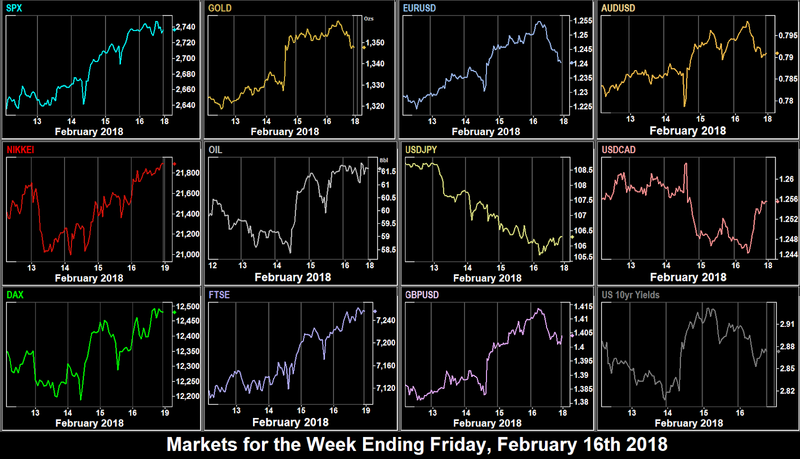 Other indices were also buoyant, helped by their denominated currencies fading against USD, which came back up from three-year lows, and the VIX touched a post-correction low of 17.7. USD was up across the board, with DXY putting on 0.57% and Gold giving up $5 (0.41%). Oil was also up in line. Yields continued their pattern of moving inversely to USD, easing 3bp on the day. 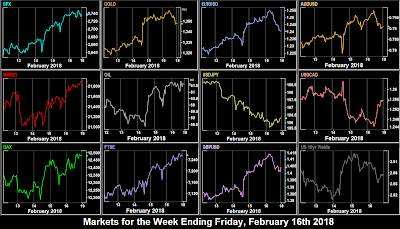 Last week’s equity reversals partly recovered so we had an inside week on all indices except NKY. DXY had another bad week, giving up all the previous week’s gains and then some. All currencies were up against the dollar, so selling USDJPY would have been the best trade, down 2.30%. The best index recovery, and overall best trade was SPX at 4.19% up. Cryptocurrencies had a great recovery week. Bitcoin was up 26% from last week to $10,600 as I write and Ethereum up 18.6% at $963. Monday is President’s Day, the birthday of first president George Washington and US markets are closed. Canada is also closed for Family Day. China is still out for the Golden (New Year) week. There are no economic releases on the calendar except the Japanese trade figures. US index futures trade as normal. Tuesday sees the RBA monthly minutes, although nothing untoward is expected. There is some data from Europe, as listed below, and Swedish CPI at 0830, but in general another quiet day. 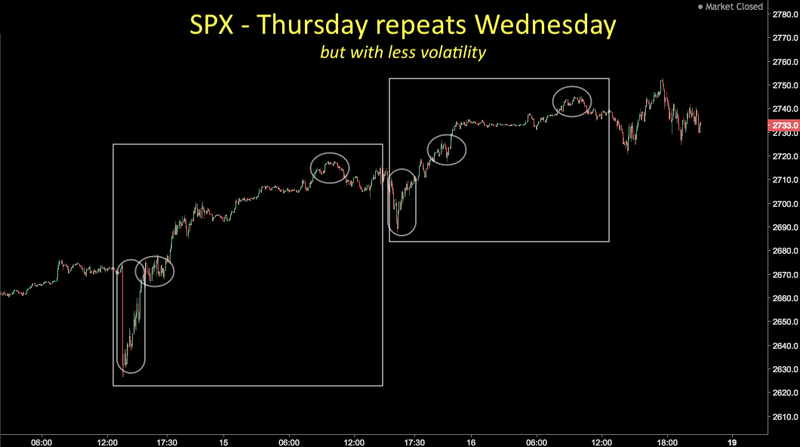 However, volatility in the US was rampant right up to Friday’s close, so there is no reason not to expect more. WMT (2.86% of DJIA) reports before the US Open. Wednesday is much busier, and is of course FOMC Day. These are the minutes from Jan 31, Janet Yellen’s last meeting and before the recent correction in equities. Nevertheless, there may be some less guarded swan song remarks from the outgoing chair. Also from the Fed, we heard Harker (neutral, non-voter) at 1400. In the UK traders will be keenly watching the average earnings, the sticking point for rate rises. Later in the day, BoE Gov Carney, Sep Gov Broadbent, Chief Economist Haldane, and MPC member Tenreyro will all be testifying to the UK Parliament. Another chance for the recent hawkishness we have seen from the BoE. If either of these event disappoints, the rate hike in May will look less assured which would push cable down. In South Africa, new President Ramaphosa makes his first Budget Speech at 1200, after the CPI release there at 0800. China’s markets open after Golden (New Year) Week on Thursday. The day is dominated by the ECB Minutes at 1230. Traders will be looking for further details of QE unwinding. There is little US data, but we have several Fed speakers as listed. Canadian Retail Sales are also important. The data is only released on a MoM basis, there is no YoY figure. Tech heavyweight HPQ reports after the bell. Friday’s main event is Canadian CPI. Although a hint will have been given in the Retail Sales data, this is the one which moves markets. The miss last month caused an immediate 0.49% fade in the loonie. Central bank speakers today are ECB Coeure (hawkish) at 1830, and Fed Mester (hawkish, voter) at 1830 and Williams (hawkish, voter) at 2040.